One year it was the Bone One Volume. Another, it was the three hardcover Lost Girls box set. San Diego Comic Con International does have a habit of providing consumers with one very very heavy prestigious item to fill their luggage allowance every year. With 1400 pages split over two hardcover volumes in one slipcase, with a third volume containing all the colour covers, this remastered, corrected complete volume of Terry Moore’s masterpiece will be responsible for people shedding pounds as they carry it around the convention floor, possibly a few strained arms, legs and shoulders, and maybe a slipped disc or two. 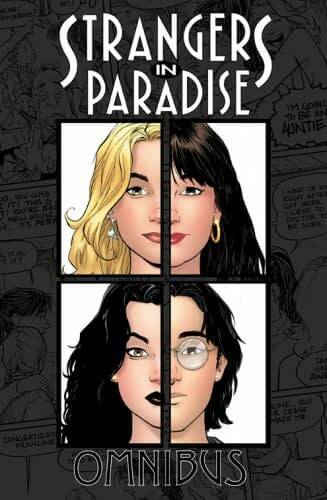 I remember buying the first issue of Strangers In Paradise from Antarctic Press back in the early nineties (though I sold it £50 a few years later, soulless capitalist that I am). The initial three-issue mini-series saw Moore launch a self published series right in the middle of the boom that catapulted the likes of Bone, Cerebus, Tyrant, Finder and Hepcats from small-time self published titles, to comics with a prominence in some cases rivalling their mainstream rivals. This series is a slice-of-life comedy that segues into tales of secrets, of families, of agents, of crime, of espionage – and embarrassing high school moments. Poetry and prose, slapstick and abuse, it’s an inconsistent ride. And it could quite possibly kill a few fanboys struggling two miles down the tracks to their motel room. That’s if they can get a copy. Even at $159.95, they are expected to sell out fast, so Abstract Press are taking preorders now, either to pick up at San Diego in July, ship out to US addresses in August, or fill comic book shop orders in September. So you can break the backs of comic shop owners or postmen the world over too.